Wheelchair rugby is a team sport for male and female athletes with a mobility-related disability in at least three limbs. It is a unique sport created by athletes with a disability that combines some elements of basketball, handball, and ice hockey. The object of the game is to carry the ball across the opposing team’s goal line. Two wheels must cross the goal line for a goal to count, and the player must have firm control of the ball when he or she crosses the line. 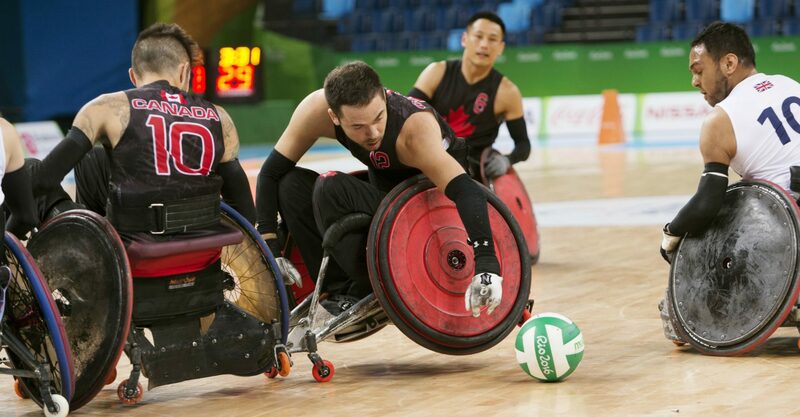 All wheelchair rugby players compete in manual wheelchairs. Players must meet the minimum disability criteria of the sport and must be classifiable under the sport classification rules. To be eligible to play, individuals must have a disability that affects both the arms and the legs. They must also be physically capable of propelling a manual wheelchair with their arms. Athletes with neurological disabilities must have at least three limbs with limited functions; athletes with non-neurological disabilities must have limited function in all four limbs. The majority of wheelchair rugby players have spinal cord injuries that have resulted in full or partial paralysis of the legs and partial paralysis of the arms. Other disability groups who are represented include polio, cerebral palsy, some forms of muscular dystrophy, dysmelia, amputations, and other neurological conditions such as Guillain-Barré Syndrome. Men and women are classified equally and compete on the same teams; there are no separate men’s and women’s competitions. However, teams are allowed an additional 0.5 points for each woman who is playing in the line-up on the court. Wheelchair rugby Duncan Campbell, founder of wheelchair rugby was invented in 1976 in Winnipeg, Canada, by a group of quadriplegic athletes who were looking for an alternative to wheelchair basketball. They wanted a sport that would allow players with reduced arm and hand function to participate equally. The sport they created, originally called murderball, is now known as wheelchair rugby. One of the founders, Duncan Campbell, still plays in BC, and has been on numerous organizing committees ranging from local to International level events. He is currently the National Director for the Bridging the Gap Program, and Wheelchair Rugby Development in Canada with CWSA. Wheelchair rugby first appeared at the World Wheelchair Games in 1990 as an exhibition event. 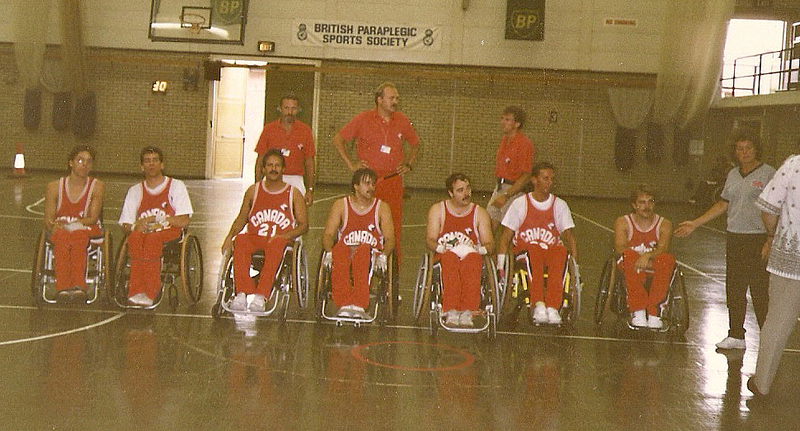 In 1993, with 15 countries actively participating, the sport was recognised as an official international sport for athletes with a disability and the International Wheelchair Rugby Federation (IWRF) was established as a sport section of the International Stoke Mandeville Wheelchair Sports Federation (ISMWSF). Seven countries participated in wheelchair rugby at the 1993 Stoke Mandeville World Wheelchair Games. In 1994, wheelchair rugby was officially recognised by the International Paralympic Committee (IPC) as a Paralympic sport. The first Wheelchair Rugby World Championships were held in Nottwil, Switzerland, in 1995, with eight teams competing. In 1996, wheelchair rugby was included as a demonstration sport in the Atlanta Paralympic Games. In 2000, Wheelchair Rugby was included for the first time in the Paralympic Games competition programme as a full-medal sport at the Sydney 2000 Paralympic Games. It was also featured at the 2004 Athens Paralympic Games, and the 2008 Beijing Paralympic Games. Wheelchair rugby is currently actively played in twenty-six countries and is under development in at least eighteen more. The IWRF currently includes three zones: Zone 1 (The Americas), with six active countries; Zone 2 (Europe), with fourteen active countries; and Zone 3 (Asia-Oceania), with six active countries. The most recent Wheelchair Rugby World Championships was held in Richmond, BC in September 2010. The next major competition in wheelchair rugby will be the London 2012 Paralympics.